Improve Your Grip and Reload Faster with the Big Mouth Magazine Well. 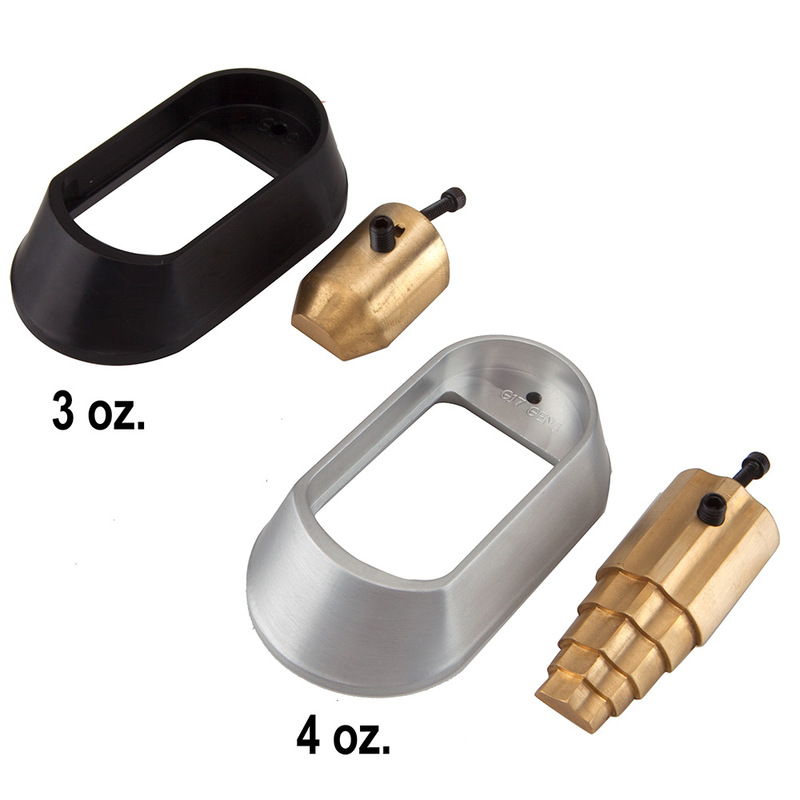 Available in six different colors in either 3oz or 4oz weights for most Glock handguns. Please Note: Gen4 Magwells are only compatible with the +0 configuration, with no additional backstraps installed. Magazine wells have been around for decades as top competition shooters know that they not only help facilitate faster reloads but they also help you acquire and maintain a more consistent grip on the handgun. The more consistent your grip, the better your accuracy from shot to shot. Especially when you are shooting fast. The Big Mouth Magazine Well is machined in the USA from a solid bar of aluminum. Available in six different colors and two weights, 3 ounces and 4 ounces. It is the largest and most functional magazine well on the market and is used by top competition shooters worldwide! I recently added a G34 to my collection. The main reason I resisted Glock for years was the weight. I never felt truly comfortable with the lightness of the polymer frame. However, the addition of the 4 oz. magwell has not only added that weighty feel I was looking for, but it enhanced my grip on the handle. The insertion of magazines now is automatic. I picked up a 3 oz. magwell for Lil Sparrow's G19. She loves it as well and has added another dimension to her shooting proficiency. Double thumbs up!!! High quality Magwell. Extra easy installation. Fits perfectly. One small problem: it's too small for magazines with Taran tactical +5 extension. Otherwise all perfect. I bought this for my 35 and it has helped me especially when doing a magazine change under time. Another great product for a reasonable price . Thanks Lenny. A must have to pair with the heavy base plate. The alignment is a little tricky though and leaves the Magwell pistol interface very tight such that I really have to slam the bottom of the base plate hard to engage the mag lock; I may need to machine the base plate a little to achieve a smoother insert with less force. Regardless, this accessory and the thug plug definitely reduces felt recoil for my G20. Works on P80 with some minor modifications!! Picked this up in Gold for a Polymer80 G34 build. Like many products designed for Glocks being used on P80's, the product requires some "custom fitting". I ordered the larger of the 2 brass inserts and had to grind down a good bit of it with my dremel to get it to slide into the bag of the P80 frame. I also had to sand down the rear corners of the P80 handle to get the screw hole to line up for the magwell to screw in to the insert. I expect with the P80 that on some level there will be fitment issues so this did not deter me from buying this product. The weight and feel is great now that I got it on there. Just a note of caution, it will fit on a P80 full size frame with some slight modifications to both the brass weight and the magwell. The lighter weight may fit better. IO just recently got one of these for my Glock 17 and I'm asking myself why didn't I do it sooner. It added weight to the back end of the gun and a better grip on the gun. Now I know! Thanks Glock Store for the service and the parts.